Installed my new glove box. Got my bed sides painted. Set new glass in the wing and door window assemblies. Got the Nu Relics power unit installed and tested the switch that uses the original window crank handle. removed the passenger side inner rocker, outer rocker and cab corner. What a beating that was. Welded in the new inner rocker in. The cab corner patch panel looks to be less than an ideal match, but I guess we'll. what belt line felts are you using and are you vent windows the ones that you can buy pre assembled and if so how do you like them? 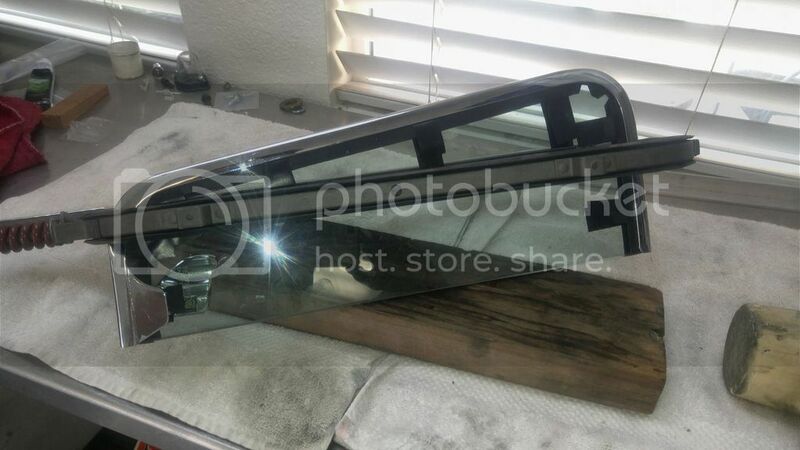 I had restored my original wing window assemblies many years ago. I was disheartened to see the damage a couple of local glass shops did to wing window frames of other people, so I decided to set the glass myself. I only have the door fuzzies on the inner side - the two different sets (Precision and Classic Parts) I had were both too thick for the outside. Not sure what I'm going to do...I might try to modify a set if passenger car outer rubber sweeps. Last edited by vin63; 02-20-2017 at 05:14 PM. Installed driveshaft, new alternate bracket and put the hood back on by myself...I don't fully recommend it as a solo job. Oh yeah, then i drove it for the first time with the engine swap complete! -First build, lots of plans, little experience. What's the worst that could happen? Installed my bed floor after having it out for 8 years. I called in sick today- bad cold. It's raining here all day. Wife's new car usually occupies the garage, but felt the need to get Ol'Blue out of the rain. Everybody has to believe in something. I believe I'll have another beer. Finally assembled and leaving for the body shop for final paint. Picked up a set of 22 inch transit wheels. Painted them white with Duplie-color color match and clear coated them with Spray Max 2K. Installed a set of Lionhart LH-EIGHT 265/35R22 tires and picked up and installed a set of Chevy Wheel Dress Up Kit with Polished Collar from Billet Proof Designs. Changed out my broken speedo cable and ordered a new gas gauge. Next I will be dropping it with SS-7 Bags, Drop spindles and a C notch. went "Shopping" for a grille insert at a local yard. Found a complete '61 grille intact but the lower parts were pretty rusty, good thing i only needed the "Chevrolet" insert. Drilled out the rivets and was able to massage the aluminium back to straight enough. Picked up extra bed fenders for future tubbing and a "non antenna" corner cowl. Started work on the new exhaust system. Stole some company time to model up the 1961 X-Frame and get an idea for routing the 2.5" pipe and placement options for the crossover pipe and Thrush Welded mufflers. Spent another 2 hours laying under the truck pulling pieces of the Speedway DIY Exhaust Kit in and out to get a real layout of angles and measurements. I should start making cuts and getting a full mock up this weekend. Have fun with the rear track bar. That was what I always had problems with when running the exhaust over the rear axle on these trucks. There seems to be enough room between the track bar and the axle, at least on the drivers side. With the truck lowered 3" in the rear I'm hoping there is clearance. Worst case would be exit to the sides before the rear wheels, but I would like to exhaust out the back. Is it unheard of to run under the axle? Ran some wire, a heavy duty flasher and now I have 4 way flashers on my 65 Suburban with a 72 tilt column. Job went easier than I thought. Also changed my ign. lock cylinder and added "sleepy eyes" on my headlights(half shields). Going out for knee surgery soon so have to get all my little things done. Next is my gas sending unit. I took off my front bumper guards and then went looking for bumper bolts, couldn't find any here in town. I started digging through an old coffee can of bolts my Dad had (passed away about 22 years ago) and found 2 old bumper bolts. It brought tears to my eyes thinking he was still watching out for me. I put my gas tank back in the truck. i had taken it out because i was sure the 12 year old gas in it had turned to gum, and the sending unit wasn't working. It was surprisingly clean inside, some really fine dust and a small amount of sand, and only some small rust spots, about the same amount when i last pulled the tank 25 years ago. the sending unit was fixed by cutting out the 2 sections that pack rats had snacked on. I'm a happy camper, its been a while since i had a working gas guage. 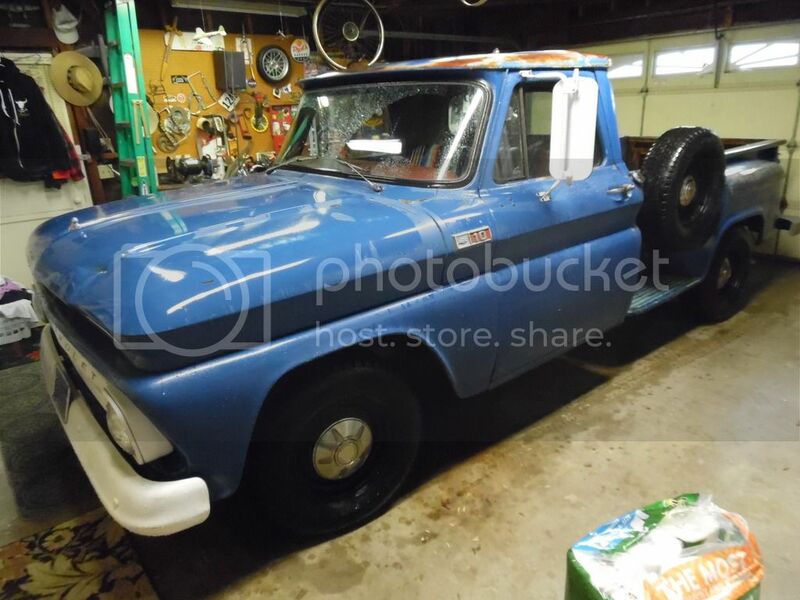 1965 Suburban, 2 wd.,292, 4-speed. Built my exhaust from Speedway's Mandrel Bend Kit, 2.5" and was very please with the result. This was my first attempt and exhaust. Now all i need to do is weld things together and hang it! Today I put some more chrome braided sleeving on the hoses. Got a new carb today and installed it.